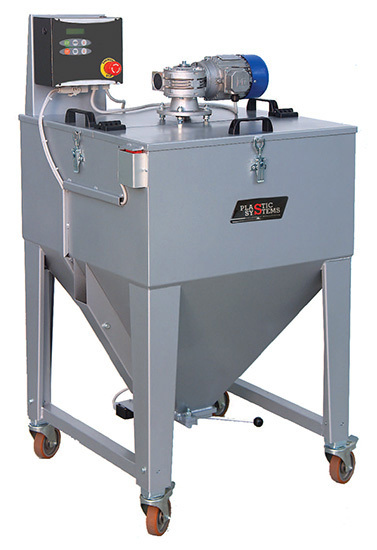 The floor-standing mixers of the “M” series have been designed to mix plastic granules such as masterbatch, additives, regrind material. These mixers have capacities ranging from 120 to 330 liters. Thanks to their small dimensions and easy handling with wheels, they can be easily placed beside machines. A hinged cover on top of the machine makes it easy to manually load material. A suction probe allows unloading the material that has been mixed. • Loading cover with safety switch. • Bottom discharge slide gate with safety switch. • “Fountain-type” mixing system with a ducted mixing screw controlled by a three-phase gearmotor. • Microprocessor-based control with programmable timer. • Probe holder pipe for pneumatic suction of the blend.